I had no idea, but evidently I started a bit of a donny-brook. Cool! Another frequently heard story is that stored procedures get and reuse execution plans, but ad hoc queries do not. A lot of people believe this and say as much online and in the real world. Unlike my last myth, this time, I’m going to give you the DBA answer to this question. It depends. And as ad hoc TSQL goes, that one is actually some what clean. They get a lot worse. But, in this case, each and every time the @value variable is changed, you’re going to get a different execution plan. That’s because the full text of the query is used to determine if the existing plan will work for the new query and changing the @value variable will result in a change to that text. From the top, I ran each query in order as listed here in the article, changing the value passed once each time I called query. You first see a cache miss for the pure ad hoc query. It inserts to the cache and finishes the batch. Then, the next ad hoc query has a cache miss, a cache insert, and completes it’s batch. Proving that ad hoc queries with only a small change will restult in multiple execution plans. Then we move on to the sp_executesql queries. They start out the same way, with a cache miss and an insert before the batch is completed. Note, the cache insert is for a different set of code than is immediately visible based on what we’ve provided. The TextData column starts with “(@internalvalue int)…” and procedes to show the rest of the query. This is the use of sp_executesql at work. It’s creating a parameterized query, effectively the same thing as a stored procedure. Then, with the second call to sp_executesql, we see a cache miss followed by a cache hit. This is the classic pattern for a successful call to the plan cache. If you don’t trust that, the last two batches are the stored procedure. You can see that the first call to the procedure results in the same cache miss followed by a cache insert that every other first call had. The second call to the stored procedure had a cache miss followed by a cache hit. 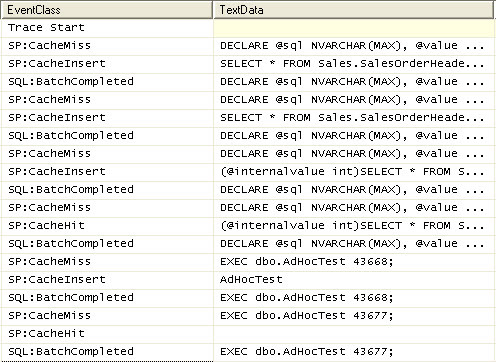 The same as the second, ad hoc sql, call to sp_executesql. That, my friends, is plan reuse in action from an ad hoc query. Myth 1/2 Busted. Or maybe: Myth “It Depends” Busted. I’m just going through the chapter on the procedure cache in the new book and I’m having a blast playing with the dynamic management views and functions that let you access the procedure cache. It’s just too much fun and way too easy to get detailed information about the queries in the system, not like the old days. First, you can access the cache itself with the DMV, sys.dm_exec_cached_plans. This shows some of the data describing the plan in cache, but most importantly it provides the plan_handle. You need this for other joins later. You can also use sys.dm_exec_query_stats to get aggregated performance statistics about the plan. It also has the plan_handle and two things new to SQL Server 2008, the query_hash and the query_plan_hash, also known as query fingerprints. I’ll get into those things another day, but they’re pretty exciting all by themselves. Finally, you can also get information about currently executing queries, which may or may not be in the cache, through sys.dm_exec_requests. These are all views, so you can just query them directly. Unfortunately, the first two don’t offer any chance to filter the information returned by database or spid, etc., but sys.dm_exec_requests does. You’ll get an XML plan, which, when you click on it in 2008 opens up as a graphical plan since, to Management Studio in 2008, they’re the same thing. Easy-peasy. But what about that query that’s hanging up and blocking all the othe query’s? What the heck did the developers do this time? Let’s try out the DMF sys.dm_exec_sql_text ( plan_handle ). You’ll see the query, as it was passed, in the text field. Great stuff. Really handy. There is a ton to explore here and it’s all very useful stuff. These are available in SQL Server 2005 in addition to SQL Server 2008. For what should have been a single plan, I have four (or more) clogging up the cache and causing unecessary compiles, etc. I’m not completely enamored with what this tool is going to do tofor me as a dba.